The BlackBerry A10 has allegedly popped up in another photo leak, this time with both its front and back sides entering the spotlight. Vietnamese Twitter user Vũ Thạnh (@nvthanh1994) snapped three photos of what he claims is the BlackBerry A10, code named "Aristo." 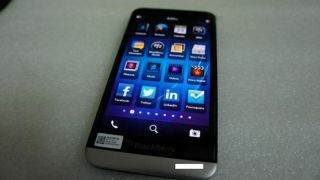 The BlackBerry Z10 successor is rumored to pack a 5-inch 720p Super AMOLED display, a 1.7GHz dual-core processor and discrete GPU. It's also said to have eight and 2-megapixel cameras, 16GB of storage, LTE, NFC, microSD, a 2,800 mAh battery and BlackBerry 10.2. Wow, we actually have a lot on this device, don't we? Those specs might not exactly make the BlackBerry A10 a Galaxy S4 or HTC One killer, but it should nevertheless prove the most powerful BB10 phone yet. The BlackBerry A10 is expected to arrive in time for the holidays, possibly as early as November. Today's leak seems to match the last one, which appeared earlier this month on BGR. Shortly after that leak, a full A10 specs sheet for the expected BlackBerry hero leaked as well. Yet another A10 leak, also from Vietnam, appeared around the same time, this one a video. The exact form factor of the A10 has yet to completely take shape, as few have held it in their hands, but we're certainly liking the look of it. Expect to see more and more of the A10 as the summer comes to a close. Sprint may be late to the BlackBerry Q10 party, but the U.S. carrier could lead the charge when it comes to the A10.